While I’m not totally dismissing it, I’m certainly quite skeptical about the Virgin Atlantic upgrade advice offered by Bloomberg. Bloomberg is in the midst of a “high-end travel hacks” series featuring “notable” names in food, wine, fashion, cars, real estate. This story is entitled The two words that will help get an airline upgrade over the phone and features the advice of best-selling author Tilly Bagshawe. She’s a British expat living in Los Angeles and flies frequently to London, always on Virgin. Why Virgin? …The cabin crew are so nice, always laughing. It has the best entertainment system, especially children, and they bring fab ice lollies in the middle of the flight, which is one of my children’s favorite thing. We have never bought an upper-class seat; if ever we’ve flown anywhere up front, we’ve used miles to upgrade from economy. If you want to do that, call reservations and drop the name “revenue management.” The reason is that revenue management’s job is to make sure a flight is profitable, so they’re the ones telling [reservation agents] what they can say; they’re like Flying Club’s boss. Not everyone knows that this department exists, and by mentioning it you reveal yourself as someone who knows how things work and understands how seats are released. 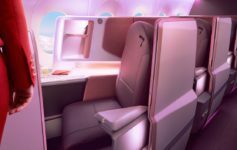 Say to the agent: ‘Have revenue management released any first-class seats for miles upgrades yet?’ When they say no, ask them to check or just be put through to revenue management so you can ask when they will release some, as well as how many seats are left. Politely respond like this: ‘You have 20 seats unsold? Why aren’t you releasing them?’ Often by the end of the conversation they say, ‘OK, we’ll release one for you,’ or they might tell you to call back tomorrow. Doing that, we’ve had a pretty much 100 percent success rate. I question whether Virgin Atlantic will put customers through to an actual revenue management member. I also question whether revenue management would willingly release award or upgrade seats based upon a plea questioning the agent how s/he does her job (i.e. questioning revenue management). Then again, pestering Singapore Airlines on the phone does pay dividends to clear waitlisted awards. Note that we are not talking about free upgrades here, just upgrades supported by miles. If you’re going to do this, I recommend doing it in the final days before your flight. I simply cannot imagine a scenario where upgrade space would be made available if there were “20 seats unsold” and the flight was still a month away. Most of the pricey business class tickets are purchased last-minute. If securing upgrade space was as easy as uttering the magic words, revenue management, I think we’d hear about it more often. But do let me know in the comments section below if you’ve had luck upgrading like Tilly. Surely someone this well versed in fare classes would realise VS doesn’t have First Class so wouldn’t ask for available seats in that fare class? She has to sound knowledgeable. Even though it’s the most stupid thing to put in the papers if it actually worked. Like bloggers she makes more money selling us the story than actually living the story. Her books appeal to the lowest common denominator…sequels to Sydney Sheldon novels. So it’s likely that her readers would believe that all they have to do is ask nicely and a points upgrade can be theirs( a bit like believing that wearing a suit and tie at checkin is going to score an upgrade. Same mentality). Strange for Bloomberg to publish such nonsense and in any case no one who reads in the Sydney Sheldon genre is paying attention to Bloomberg.